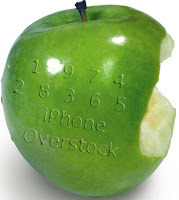 Financial analysts are looking for an answer to Apple's iPhone mathematics problem. What raised concern on Wall Street is the discrepancy between the number of iPhones Apple says it has shipped since launching the gadget last summer and the number of iPhones sold by AT&T, the exclusive wireless service provider in the United States. In reporting quarterly earnings this week, Apple said it had shipped 4 million iPhones. During its quarterly report, AT&T said it had about 2 million iPhone customers as of the end of 2007. Both sides have said they're happy with the product's performance in the market, and Apple remains confident that it can hit its target of 10 million phones shipped within its first year of sales. But financial analysts are wondering whether there's trouble brewing. Analysts at Sanford Bernstein have come up with some slightly different numbers than the vendors, TheStreet.com reported Friday. Bernstein estimates that Apple shipped 3.75 million phones in total, and telephone companies worldwide have activated 2.35 million. Assuming that 20% of the unactivated phones may have been unlocked to work on other networks that still leaves 670,000 iPhones unaccounted for. If Bernstein's estimates are correct, then Apple may have to contend with a growing pile of unsold iPhones, TheStreet said. Apple did not return a phone call seeking comment. Beyond the troubling iPhone numbers, Apple's stock took a beating in after-hours trading following its financial report, despite record earnings. Investors apparently are getting the jitters over a possible global economic slowdown that could hurt Apple's consumer electronics sales, which include the iPhone, iPod, iMac, and MacBook. Financial analysts also are concerned that Apple's iPod sales may be slowing. What has been going gangbusters at Apple are Macintosh computer sales? The company reported it shipped 2.32 million computers in the fiscal first quarter ended Dec. 29, which represented a 44% increase in shipments and a 47% boost in revenue when compared with the same period a year ago.